Most recent things first: I’ve been knitting away on my Weasley sweater–one ball of yarn down, lots more left to go. So far so, good. I’m finding purling is less awkward when it’s the whole row rather than alternated with knit stitches as in the ribbing I did on the hats. It was hard to see how much progress I was making on the sweater for a while, since the stockinette curls so–I’d knit and knit and the piece didn’t seem to get any longer. (I later realized that the curl was the perfect place to hide the extra long tail I’d left to use later to sew up the seam; tucked up in there, it can’t catch the working yarn like it had been.) Once I could see some length, I worried that it was too wide, even though I was getting gauge. When I held it up against a sweater that fits me okay, though, it turned out to be quite a reasonable size. I think it’s just that this is the widest thing I’ve knitted (well, except the sweater of shame, and I’m pretending that was someone else) and so it looks huge in comparison. It feels like I have a long way to go with this, probably because I do. I haven’t yet worked out the chart for the letter on the front–I figure I’ve got plenty of time. 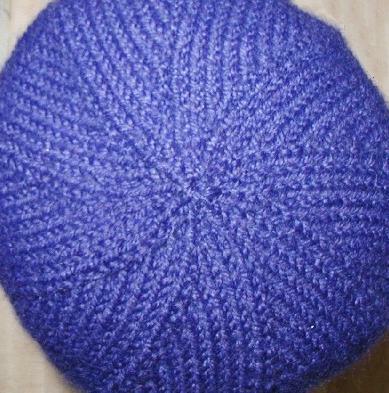 Before I started the sweater, I finished another hat (modeled here by the blender Mr. Karen uses to make smoothies). 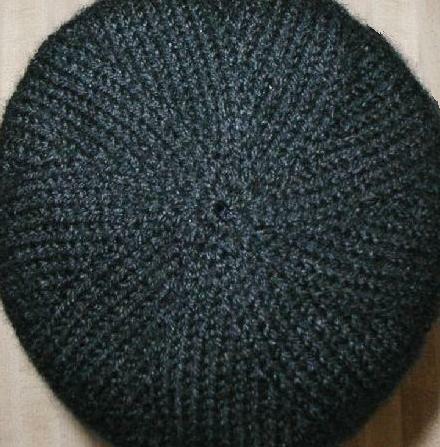 It’s the same double layer hat as the other one; this one is all black on the other side. This time I made it a bit bigger around and added several more rows, mostly in the ribbing. The fit is definitely better on this one, though I still think it could do with a bit more ribbing. I do really like how the increases and decreases look. The purple (Plymouth Encore 1034) and black (Encore 217) coordinate with the coat I wear to work most days–black with a purple Purple Systems logo on it. Also before the sweater, I did more swatches. Not only did I knit them, I washed them–in the shampoo I got at the hotel where the quilt retreat was held, so they smell pretty. RYC (by Rowan) Cashsoft DK by Rowan (57% merino wool, 33% microfiber, 10% cashmere). Oh, my. This is so soft and wonderful and pleasant to work with. I’m sort of wishing I hadn’t bought this one ball, because now I have a taste for it. But hey, it’s a lot cheaper than pure cashmere, right? Gauge I got was similar to the Cambridge width-wise, a little less in height. Mountain Colors Twizzle (85% merino wool, 15% silk). This is just gorgeous to look at. The store only had one skein, which I resisted the first time I was in but when it was still there several weeks later, I had to have it. The gauge is similar to the Cashsoft–maybe I could make a really soft striped scarf with the two of them (though I’d have to get a more Cashsoft, in a different color or colors). This is the Berroco Ultra Alpaca (50% merino, 50% alpaca) that I got at the store where Lil works. The picture doesn’t do the color justice–it’s a subtle heathery mix of blue and berry and brown. It seems like it’ll be nice to work with. I’m considering making these wrist warmers with it but am also pondering gloves. Sure, gloves seem hard now, but maybe they won’t always. And here’s the Filtes-King Stampato Extra–or maybe it’s Extra Stampato (100% Australian Merino). This is the other yarn I got when Lil and I went to her store, the one that’s supposed to be mittens someday. This one gave me a little bit of trouble with split stitches–it has a lot of plies for me to stick my needle tips between–but when I paid attention it worked up just fine.